Mix gherkin dip, lemon rind, chopped dill and cracked pepper together. Lay smoked salmon slices out on a flat board. Slice into even strips (approx. 3-4cm wide). Spread each slice with a thin layer of gherkin mix. 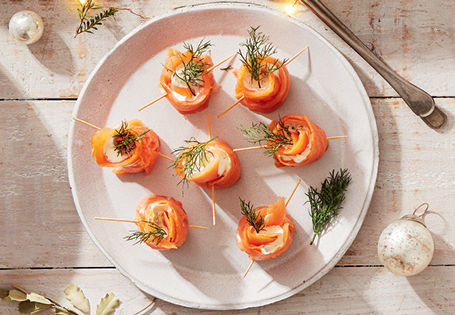 Roll up salmon and secure with a toothpick. Place on platter. Top with cracked pepper and a sprig of dill.